Josiah Bartlett’s family has been traced back to the time of William the Conqueror. The family’s records in Stopham show that Brian, a knight (described in ancient sources as Guido de Brionne), and his Esquire, Adam Barttelot, sailed over from the Liseux district of Normandy with William the Conqueror. They fought at the Battle of Hastings in 1066 and both are listed on the Battle Abbey Roll of participants. After the Conquest Sir Brian assumed the name of Brian de Stopham and both he and Adam Barttelot received grants of land in Sussex that became the village of Stopham. These lands had formerly been owned by a Saxon family by the name of Ford. The name “Berthelot”, thought to be a variant of Barttelot, is still current in Normandy. There is speculation that Adam Barttelot was a 7th generation descendant of Prince Berthelot, a nephew of Charlemagne. On the Battle Abbey Role he is named “Berteulay”. Afterwards it sometimes occurs as “Adam de Bertuilay” and “Adam de Bartelot”. In Levi Bartlett’s book the Barttelot family lineage tree chronicles 21 generations of Barttelots starting with Adam, and concluding with Col. Walter Barttelot who represented the 21st generation. He is identified in Bartlett’s book as Sir Walter D. Barttelot, M.P., J. P. and D. L., Capt. Royal Dragoons. 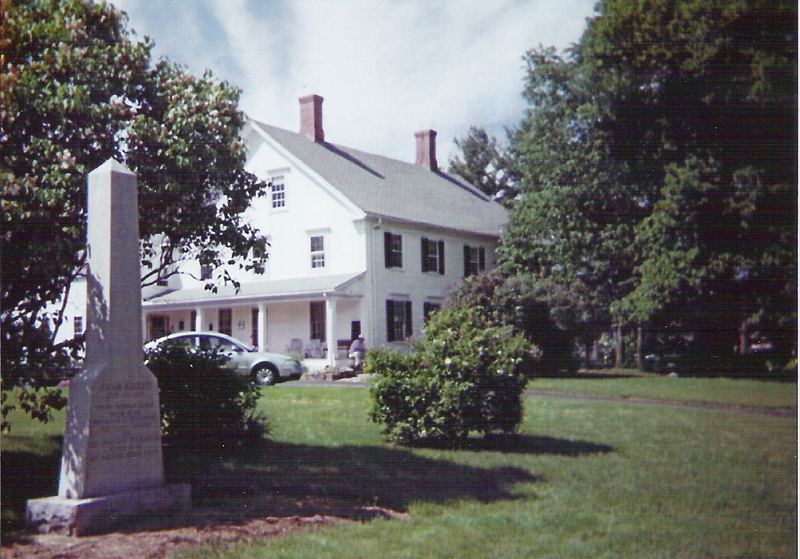 Levi Bartlett writes that “The Bartlett families settled in and around the place called Bartlett’s Cove in Newbury, opposite Amesbury Ferry. Richard operated the ferry between Amesbury and Newbury, and that area in Newbury is now Maudsley State Park. 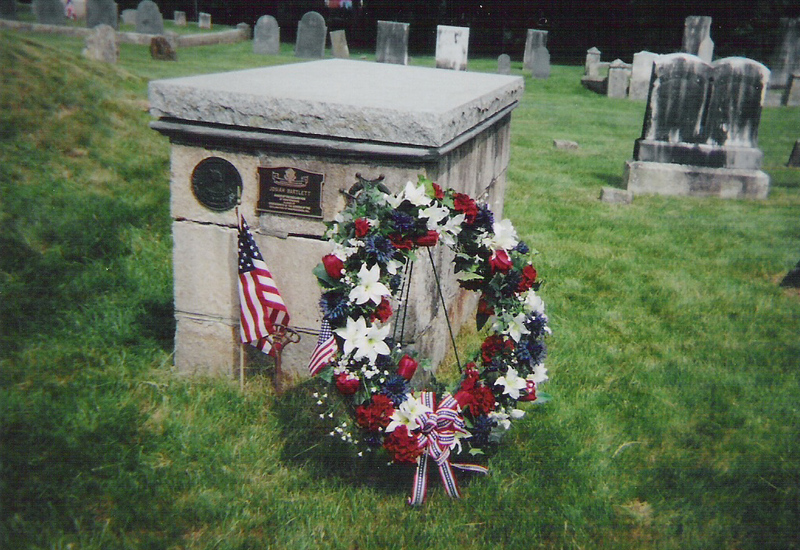 Richard died on May 25, 1647 and is buried in the old Sawyer Burying Ground in Newbury. He married Joanne (—-) in Stopham and she died in Newbury. Richard Bartlett, Jr. was born in England in 1621 and was 14 years old when he arrived in Newbury with his father. He was said by Tristram Coffin to have been a facetious and intelligent man, residing first near Oldtown Hill but afterward moving up to a place since, and now, called Bartlett’s Corner, just above the chain bridge. Richard, Jr. married Abigail (—-) who died March 1, 1687. Richard, Jr. was a representative in the colonial legislature from 1679-81 and again in 1684. He died at Newbury in 1698 when he was 77 years old. Richard Bartlett (the third of the name), the son of Richard Bartlett, Jr., was born on February 21, 1649. He married Hannah Emery of Newbury on November 18, 1673. He was Josiah Bartlett’s grandfather. 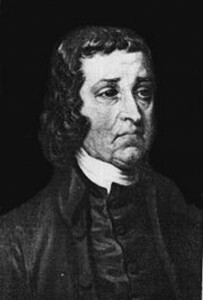 Stephen Bartlett, the father of Josiah Bartlett, was born on April 21, 1691, the eighth of ten children. He married Hannah Webster of Salisbury, whose father was “wealthy in landed property.” Stephen became a shoemaker, and worked at this trade for a number of years. He built a large house a short distance above Amesbury Ferry, where he reared a family of seven children including young Josiah Bartlett. After spending his younger years there in Ferry Street, Stephen purchased a farm in the north-west part of Amesbury called “The Lion’s Mouth” and lived there the rest of his life. Hannah Webster was the great-granddaughter of John Webster, who came from Ipswich, England, and who was admitted as a freeman at Boston on March 4, 1634. He moved to Ipswich, Massachusetts in 1642 and worked as a baker. There he married Mary Shatswell, whose home occupied the lot adjoining his. The family subsequently moved to Newbury where John Webster died in 1646. His widow remarried and lived until 1694. Josiah Bartlett, the future signer of the Declaration of Independence, was born on November 21, 1729 at Amesbury, Massachusetts, the youngest child of Stephen and Hannah (Webster) Bartlett. Josiah grew up in Amesbury, received some formal education from the Amesbury schoolmaster, and acquired knowledge of Greek and Latin under the tutelage of a relative, Reverend Doctor John Webster. When he was sixteen Bartlett began the study of medicine in the office of Dr. James Ordway. Dr. Ordway was a practical man with little scientific background, but he provided young Bartlett with instruction in basic practice. Young Josiah consulted the libraries of Dr. Ordway and neighboring towns to supplement his medical knowledge, but since medical books were hard to come by Bartlett also developed a fondness for books on history and mathematics. 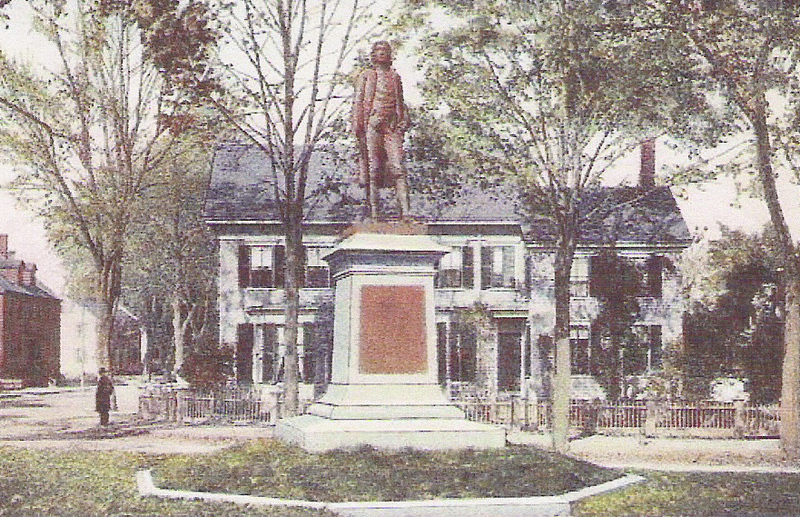 In 1750, at the age of 21, he moved ten miles north to Kingston, New Hampshire and began to practice medicine. He arrived there with only a decent quantity of apparel, about $30, a small horse, saddle, bridle, saddlebags, with a small bill of medicine, a pocket case of surgeon’s instruments and some instruments for pulling teeth. At first, Bartlett boarded with the Rev. Joseph Seccombe, a gentleman of considerable liberality of mind and the possessor of a valuable library. Here Bartlett found an ample opportunity for improvement, both from his conversations with Rev. Seccombe, whose general knowledge and experience was extensive for the times, and from the Reverend’s library which Bartlett used extensively. His expertise and concern for his patients helped Bartlett become a popular and prosperous country doctor. Early on, in 1752, when confronted with a life threatening fever, Bartlett treated himself (against the express wishes of his attending physician Dr. Ordway) with repeat dosages of cooling cider and soon recovered. At that time, such fevers were treated by keeping the patient from drinking water or other cool liquids, loading him with cloths, keeping him in a confined room with hot air, and drenching him with hot liquids and heating medicines until the natural strength of the patient’s constitution enabled him to recover, or until death. He gained recognition several years later during an outbreak of diphtheria (then known as throat distemper) which killed 114 people in Kingston. He successfully treated patients, including his own children, with a new procedure, Peruvian bark (quinine), and prescribed cooling liquids to temper fever. At that time the treatment for distemper consisted of bleeding, emetics, depressing drugs and starvation, a treatment which often led to the patient’s demise. Bartlett’s success in combating this plague, which was particularly lethal for children under 10 years of age, earned him much praise, and he became renowned for relying on observation and experimentation in the diagnosis and treatment of his patients. In 1765 he entered into a medical practice partnership with Dr. Amos Gale. Soon after arriving in Kingston, in 1754, Josiah married Mary Bartlett, his first cousin. They had twelve children, eight of whom lived to adulthood. Mary was described as an amiable girl, well grown and well educated for the time. She proved to be a loving and true helpmate, managing their home and farm, and bearing the burdens of raising their children, staying in touch with his patients and personal friends throughout her life, and keeping Josiah apprised of developments in Kingston during his many absences. Josiah, for his part, shared with her in letters his concern about their family, dispensed advice on domestic matters, while describing his activities, hopes, and fears about the troubles and dangers that menaced the country. 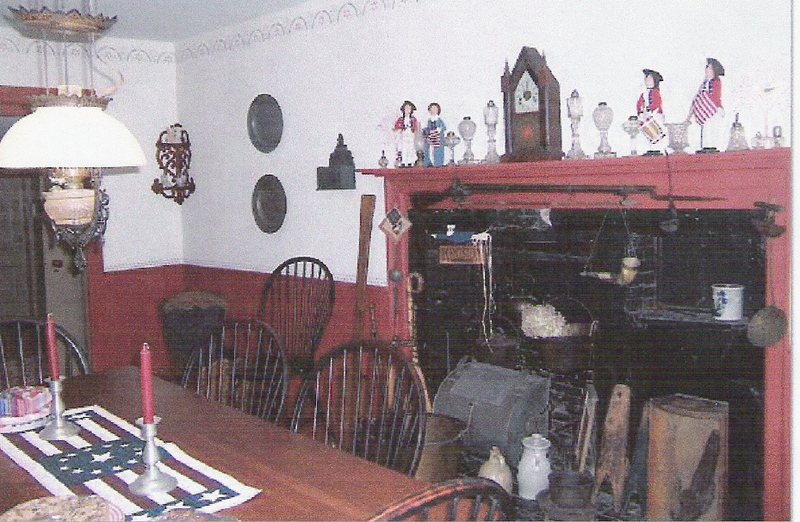 Many families in colonial New England suffered from Indian raids and the Bartlett family was no exception. Joseph Bartlett, Mary’s father (and Josiah’s uncle and father-in-law), was a member of the local militia in Haverhill in the early 1700s. He was on duty on August 29, 1707 when 200 French and their Indian allies launched an attack on the community, burning houses, and killing or capturing a number of inhabitants. After providing a spirited defense Joseph was finally overcome and captured. He was carried to Canada where he was forced to live for four years before being redeemed in 1711. Growing in stature and reputation, Josiah Bartlett was elected town selectman in 1757, where he earned a reputation for his intelligence, strict integrity and sound judgment. Showing a marked public spirit and interest in public affairs, he earned the respect and trust of his fellow citizens, and was chosen to represent Kingston in the New Hampshire Provincial Assembly in 1765. From the outset he supported colonial interests, but was often in the minority when their interests were threatened. This put him frequently at odds with the positions taken by Royal Governor Wentworth. During this time Bartlett raised the Seventh Militia Regiment, and was appointed by Wentworth to serve as the liaison between the Provincial Assembly and the Governor during the Stamp Act controversy in 1765. In 1767, when Josiah was 38 years of age, Governor Wentworth appointed him justice of the peace and soon thereafter a Lieutenant Commander of the Seventh Militia Regiment. In making these appointments Wentworth not only recognized Bartlett’s many talents, but also hoped to enlist Bartlett’s support for the royalist cause. But by 1774 Bartlett had become an active patriot and a firm supporter of colonial interests. 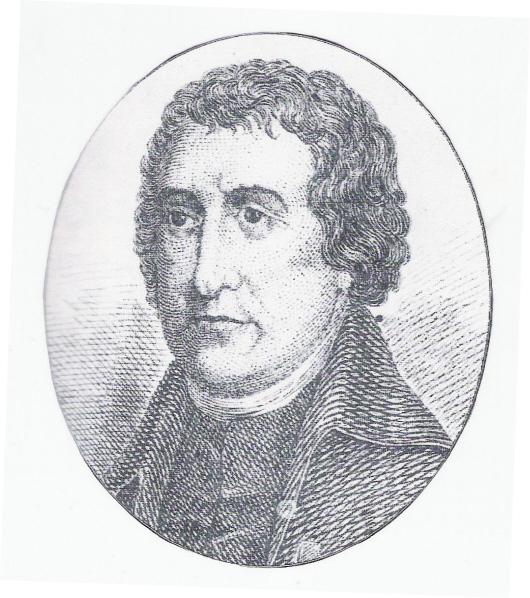 Before Governor Wentworth dissolved the Royal Assembly, Bartlett became head of the then illegal Committee of Correspondence of the Provincial Assembly, where he was in active communication with Samuel Adams and other patriots in Massachusetts and Connecticut. He was one of two delegates chosen to represent New Hampshire in the First Continental Congress, but was unable to accept when his home was burned down, an act blamed on loyalists who opposed his patriotic endeavors. Bartlett had been warned beforehand to cease his “pernicious activity.” He immediately rebuilt his home on the same site and it stands there to this day. 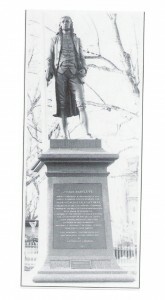 In February 1775, despairing of Bartlett’s support, Governor Wentworth dismissed him from all of his appointed offices for his open resistance to the Crown. Soon after hostilities broke out at Lexington and Concord, Governor Wentworth fled from New Hampshire, boarding a British warship moored in Portsmouth harbor. With English civil government ended, a provincial New Hampshire congress was formed and a close friend of Bartlett’s, Matthew Thornton, also a doctor and a future signer of the Declaration himself, was elected President. Later in 1775 and again in 1776 Bartlett was chosen as a delegate to the Continental Congress. Here he was among the most active delegates, serving on committees dealing with secret correspondence, marine affairs, medicine, clothing, and the qualifications of army officers. In voting for independence on July 2, tradition has it that “He made the rafters shake with the loudness of his approval.” On July 4 he was the first to vote in favor of adopting the Declaration of Independence and a month later was the second to sign it. He was absent from Congress for a time in 1777 when he joined General Stark in Vermont to furnish New Hampshire troops, and the wounded there, with medical supplies and assistance after the American victory at the Battle of Bennington. After much negotiation, much of it over state boundaries, representation and the powers of the proposed government, the Articles of Confederation were finally completed. 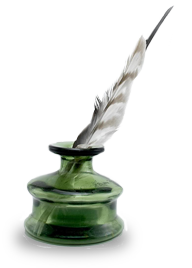 Bartlett was the first to vote for the Articles on November 15, 1777 and the first to sign it. Leaving Philadelphia later in 1778 due to ill health, Bartlett returned to New Hampshire where he began an important career as a jurist. He served as judge of the common pleas from 1779 to 1782, became an associate justice of the New Hampshire Superior Court in 1782, and was named Chief Justice of the Court in 1788. Despite his lack of legal training, he earned accolades for his administration of fair and true justice. In 1788, at the age of 59, Bartlett was appointed a delegate to the New Hampshire State Convention which was called to consider ratification of the new U. S. Constitution. He was a strong advocate for its adoption and served as the temporary chairman of the Convention. Effectively reassuring the smaller communities who were initially opposed, he used his influence, stature and persuasiveness to help secure the state’s ratification in a close 47 to 37 vote. By becoming the ninth state to ratify the Constitution, New Hampshire ensured that the formation of the new government of the United States would take place under the provisions of the new U.S. Constitution. Elected to the U.S. Senate from New Hampshire in 1789 Bartlett declined to serve, probably due to his age and the weight of his legal duties. But in 1790 he was elected overwhelmingly as the chief executive of New Hampshire. He served for four years, the first two as President, and then Governor, in 1792, when the title was redesignated. During this time he was an ex-officio trustee of Dartmouth College. In 1790 Dr. Bartlett received an honorary degree of doctor of medicine from Dartmouth College and gave the commencement address that year at his son’s graduation. He secured a charter from the legislature in 1791 to establish the New Hampshire Medical Society, wrote the constitution and by-laws for the Society and served as its first elected President. Three of his children and seven of his grandchildren followed in his medical footsteps and became doctors. He served as an Elector for New Hampshire in the 1792 election which re-elected George Washington as President. Bartlett’s colleagues described him as tall, well built, with a fine figure and auburn hair. His manner was dignified, kind and compassionate. He was very particular in his dress, wore his hair in a queue, a white stock at his throat, ruffles at his wrists, short clothes, silk hose, low shoes with silver buckles. He possessed a quick and penetrating mind and was distinguished for a sound and accurate judgment. In the Congress his committee work was effective and much praised, but he participated infrequently in the general deliberations of the Congress as a whole, believing that there was too much talk there and too little action. Josiah Bartlett died on May 19, 1795 and is buried with his wife in the Universalist Plains Church cemetery in Kingston. “Let us pray. Heavenly Father, we gather this Memorial Day weekend for the plaque dedication of Josiah Bartlett, the second signer of the Declaration of Independence. Memorial Day weekend is a special time to remember those who died fighting for freedom or who served in our military. It is fitting that on this hallowed day and weekend we honor both a healing physician and a statesman who so fully represents all that our great country stands for. Dr. Josiah Bartlett rendered important service to our country by serving in the Continental Congress and later serving as Chief Justice of the New Hampshire Supreme Court and Governor. However, his dedication to his country saw no greater tribute than when he signed the Declaration of Independence. His patriotism to his duties in Congress and the sacrifices he made for the good of his country exemplify those whom we remember this Memorial Day weekend. A boulder and plaque in Amesbury mark the site of the house where Josiah was born and grew up. A copy of Bartlett’s original oil portrait, painted by Jonathan Trumbull, hangs in the State House at Concord, New Hampshire. A free land or a traitor’s block. Josiah Bartlett’s home, located opposite the green in the center of Kingston, and lived in for over two centuries by his descendants, is a private home and an historic landmark. A large spreading linden tree, brought back on horseback from Philadelphia by Bartlett in the 1770s, grows in front of the house. Ruth Albert showed my wife and me some of the original furnishings in 1989. Many of Bartlett’s artifacts and belongings, including his formidable surgical kit, are still in the house. The color portrait of Josiah Bartlett (see the copy below) was commissioned by Josiah Bartlett III in 1871. It is by the artist Caroline Weeks, after an earlier portrait by John Trumbull and was given to the City of Philadelphia that same year. In Washington, DC near the Washington Monument, in a special memorial park celebrating each of the 56 signers of the Declaration, is a granite block engraved with his name. Nearby in the Rotunda at the National Archives Building, is a large mural painting by Barry Faulkner showing a number of the signers of the Declaration, including Josiah Bartlett who is 4th from the left in the top row. In the Rotunda of the U. S. Capitol is the famous painting by John Trumbull entitled “The Declaration of Independence”. Josiah Bartlett is shown in a group of four seated figures on the extreme left, and he is the third from the left. In 1983 my family and I visited Stopham, the ancestral home of the Barttelot family in England dating back to the Norman conquest. Stopham seemed to us to fit the quintessential image of an English village. Small home lots with rose decked stone cottages and flowered gardens border a 13th century Norman church and surround a large circular burial ground containing a number of Barttelot headstones. We had lunch at the local pub next to the 700 year old stone bridge over the Arun River. If you Google “Stopham, England” on the internet you will find a fine color photograph of the bridge, built in 1309 by the Barttelot family. From the proprietress of the pub we learned that Sir Brian Barttelot lives in a pretty flower decked cottage on the main road close by, which we later drove past, and that Sir Brian’s uncle lives in the impressive manor house across the highway from the village and the church. She encouraged us to stop by and meet Sir Brian but it seemed inappropriate for us to arrive unannounced. Some day I hope to meet him. “I was invited down to Stopham, Sussex, and had a very pleasant visit of a single night. The present representative of the family there is Col. Walter B. Barttelot, M. P., born October, 1820.…….The estate is a large one, some 7000 or 8000 acres. The house is a large three-story stone building, perhaps 150 or more feet long–quite an establishment. He has six or eight fine horses, and as many colts growing up; fine Jersey, Sussex, Devonshire and Durham cattle, etc. A large amount of ground about the residence is simply ornamental. The farming portion is on a large scale, and everything well kept and in good condition. “…From London to Pulborough station, by rail, is two hours and fifteen minutes. The distance from the station to Col. Barttelot’s mansion is about three-fourths of a mile. In going from the station to his residence the river Arun is crossed by a stone bridge built by the family in 1309, 565 years ago…(author’s note, now almost 700 years)…From the front of the large stone mansion there is a beautiful out-look upon the South Downs, and a fine range of hills, beyond them the ocean. On two hills in sight the old Romans had left marks of their fortifications, and three or four miles away–south-east–a portion of the estate of the Earls of Arundel could be seen. Near the old Norman church, built by the family early in the 13th century, is an English yew tree planted about the time the church was erected, which is, a foot from the ground, seven and a half feet in diameter; there are, also, several large and aged cedars of Lebanon. My mother was Besse M Bartlett,borned Wellington, Ks 1896. Her father was Elijah M.Bartlett,bornWeldon,Ill,1872. Her grandfather was Nimrod Bartlett, born Green, Ill 1839. Her great grandfather was Cras Bartlett, time & place of birth not known but he was married to Margaret Ladd. Could my mother have been a decendant of Josiah Bartlerr? Phyllis, none of these names show up in the Bartlett family tree. I enjoyed your treatise immensely. Though not directly descended from Josiah, I call him “uncle” My Great Great Grandfather was 1SG Moses C Bartlett, Co B, 35th Mass., who fell at “The Crater”, 1864, in Petersburg, VA. He (and I of course) descend from Cpt. Stephen Bartlett, Josiah’s elder brother. Again, thank for the great piece on one of our Founding Fathers. Grandfather Fred Bartlett wife Elisabeth holt. Father Fred Bartlett wife Martha raiche. Are they in family tree? None of these names are in the Josiah Barlett genealogy. Mary, our records do not indicate a connection. I really enjoyed reading. 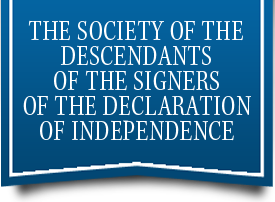 I’m assembling information of the original 56 Signers of the DOI for my children and any other interested friends and family. This provided great insight into Josiah and his family…more so than most other sites I visited. Thank you! Barry, glad the information was valuable to you. Warren, William Williams, the Signer, did have a sol Solomon. But Solomon had three children, Cornelia, Robert and William. We have no record of a Jesse Williams in the list of the Signer’s descendants. Albert, I can confirm that there is no George Dexter Bartlett in the Josiah Bartlett family tree. You might consider contacting the New England Historic Genealogical Society as they have pretty extensive genealogical records of pre-colonial New England.